Home / Roblox / Royale High / Roblox Royale High Gameplay! Part 8 - Easter EVENT - BarbiesDreams's, AngelicMou's, Marliina's, Epik Clothing & ROCK$TAR Homestore! Eggs Location & Rewards! Roblox Royale High Gameplay! Part 8 - Easter EVENT - BarbiesDreams's, AngelicMou's, Marliina's, Epik Clothing & ROCK$TAR Homestore! Eggs Location & Rewards! 🥚 Roblox Royale High Gameplay! 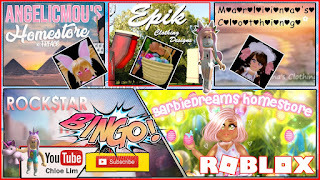 Part 8 - Easter EVENT - BarbiesDreams's, AngelicMou's, Marliina's, Epik Clothing & ROCK$TAR Homestore! Eggs Location & Rewards! Loud Warning! 0:02:04 Lets get started and go to BarbiesDreams's Homestore! 0:02:20 Easter Egg Hunt Begins! 0:07:48 I got my last egg here but after rewinding my video I still don't see the egg! 0:08:28 I got 1300 Diamonds! 0:08:58 Lets go to the next Homestore - AngelicMou's Homestore! 0:13:07 Found the cave and the last two eggs! 0:14:03 I got Fuzzy Bunny Ears! 0:14:52 Lets go to the next Homestore - Marliina's Homestore! 0:18:41 I got Spring Cleaning Headband! 0:19:36 Lets go to the next Homestore - Epik Clothing Designs Homestore! 0:28:10 Chocolate found the last egg on a lamp post! 0:28:48 I got Easter Basket! 0:30:08 Lets go to the next Homestore - ROCK$TAR Homestore! 0:35:00 I got 1500 Diamonds!